That happens to you, too, right? We had quite the operation in the garage. Obviously the highest of tech. Frying pan that used to be used inside but has been demoted to “camping frying pan” because of a missing leg? Check. In the pot (right) we would store the sap. 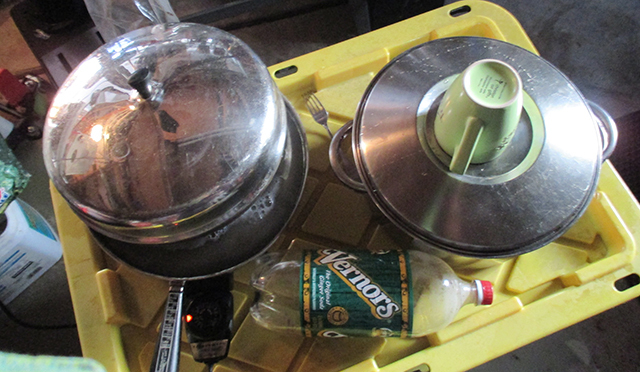 The green mug would transport the sap to the frying pan (left), which was boiling rapidly. The spare pop bottle was to serve as a substitute on the tree. Also: Vernors! Detroit YES! Paul has been tapping for Maple syrup this spring. I’d like to think I encouraged this. I’d like to think I helped, too, but, really, I didn’t help all that much. Mostly I emptied the pop bottles Paul had gathered around our two trees a few times. Paul made a great set-up. Want to know something about the maple-syrup gathering process? Well, you start when the days are above freezing, but the nights are still below freezing. I heard that, generally, this didn’t turn out to be a great spring for maple syrup…it got too warm, too fast, waking up the trees from their sleepy beds. Anyway. Want to know something else? 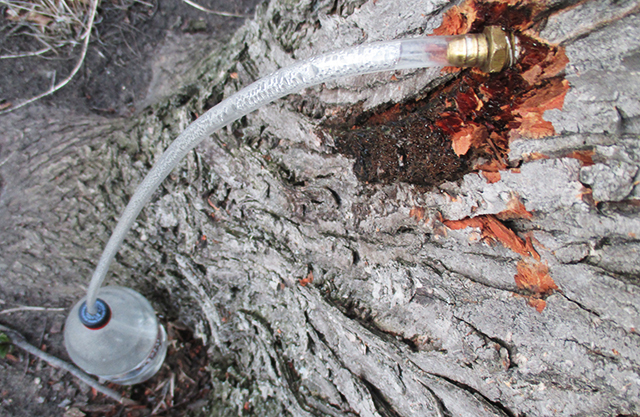 The ratio of boiled sap to maple syrup produced is 40:1. And that’s on a good day. Sometimes it’s 60:1. So, if you want one gallon of maple syrup, you’ll need to gather (at least) forty gallons of sap to boil down. As you might imagine, we don’t have a gallon of maple syrup sitting anywhere. 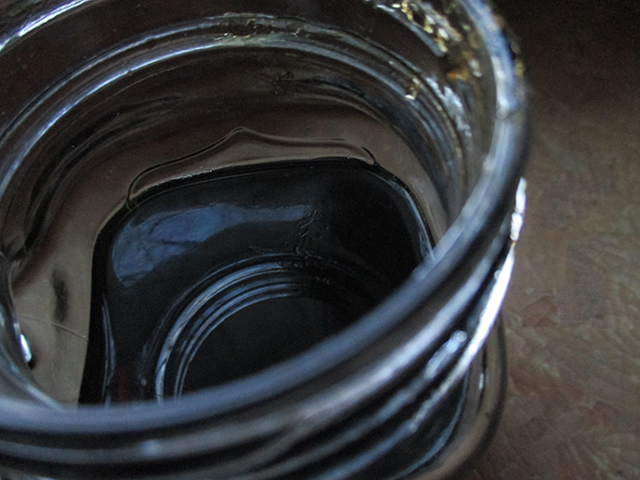 Maple syrup is sometimes called “liquid gold” since the process of making it is so consuming. Fair enough. Earlier in the spring, we had joked about quitting our day jobs and focusing solely on syrup production and setting up a stand, a la lemonaide, in our front yard for passerby (and the mailman) to buy our syrup. But, I think it’s safe to say that we’re not going to do that anymore.